Once again, students in Year 7 were challenged to build a simple trebuchet as part of an ongoing successful collaboration between the History and Design Technology department. The students had already been taken by History to visit a working trebuchet and were back in school to work in teams and try and emulate this medieval product. As always, Mr Lucas got the job of ‘helping’ the groups to test their product and there were some excellent marbles tossed through the air. A good number achieved an excellent range. 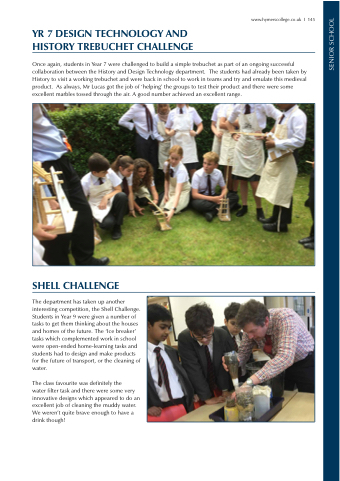 The department has taken up another interesting competition, the Shell Challenge. Students in Year 9 were given a number of tasks to get them thinking about the houses and homes of the future. The ‘Ice breaker’ tasks which complemented work in school were open-ended home-learning tasks and students had to design and make products for the future of transport, or the cleaning of water. water filter task and there were some very innovative designs which appeared to do an excellent job of cleaning the muddy water. We weren’t quite brave enough to have a drink though!